One of the oldest-inhabited places in India, Srikakulam has become a popular tourist attraction over a period of time. Owing its popularity to temples and natural sites, Srikakulam makes for a perfect weekend getaway from Visakhapatnam. Hence, you must plan a trip from Visakhapatnam to Srikakulam now if you are looking forward to exploring something new in the state of Andhra Pradesh. Srikakulam is believed to have been established by Lord Balarama, the elder brother of Lord Krishna, thousands of years ago. Therefore, it is also considered as a pilgrimage centre amongst Hindus. Today, it is mostly visited by Hindu devotees and seasonal tourists who come here to visit temples and explore beaches and other historical sites respectively. What do you think of a journey from Visakhapatnam to Srikakulam? Read on to know more about how to reach Srikakulam and its tourist spots. Srikakulam experiences hot summers and hence, most of the tourists prefer visiting it only during the months of the winter season. However, the best time to visit Srikakulam is from September until the end of March, as during this period, the climatic conditions are favourable, thereby, letting you explore the beauty of the town comfortably. By Air: The nearest airport from Srikakulam is located in Visakhapatnam at a distance of about 110 km. Hence, there is no option of reaching Srikakulam from Visakhapatnam by air. By Rail: Srikakulam has its own railway station and therefore, you can take a direct train from Visakhapatnam to Srikakulam railway station. It will take you an approximate time of 2 h to reach your destination by rail. By Road: Srikakulam is well connected to all other cities and towns by road and hence, it is easily approachable by road. Once you are on your way, you can take a break at Chintapalli and explore its beautiful beaches and natural surroundings. Chintapalli is located at a distance of about 85 km from Visakhapatnam and 45 km from Srikakulam and is a hidden hamlet which is popular only amongst locals. It is even unknown to offbeat travellers. Therefore, you must consider Chintapalli as your en route destination on account of its uncrowded beaches and secluded environment. The presence of a peaceful atmosphere in Chintapalli will certainly soothe your nerves. The major places here include Chintapalli Beach and Shiva Temple. As Srikakulam is located only at a distance of about 110 km, it is a perfect weekend getaway from Visakhapatnam. Even though it is blessed with numerous tourist spots, the most frequented ones include only temples, historic sites and beaches. Following are the major places which you must not miss visiting while in and around Srikakulam. Unarguably, the most recognised site in Srikakulam, Arasavalli Sun Temple is a 7th-century sun temple and was built by Devendra Varma, a king of the Kalinga dynasty. 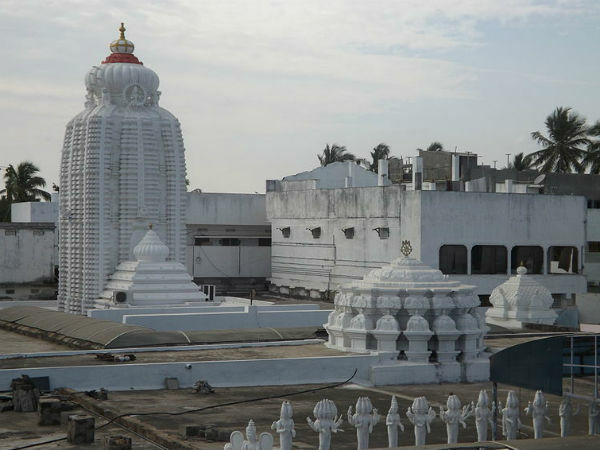 Since then, it has been a major site of worship in the region of Srikakulam. Today, on an average, it is frequented by thousands of tourists and Hindu devotees annually. Apart from its historical significance, it also boasts of its architectural beauty. There is a small tank named Indra Pushkarini in the compound of the temple where devotees come to wash away their sins and detox their soul. Another religious site, Srikurmam is a small village in the Srikakulam district and is popular for Kurmanathaswamy Temple, which is believed to have been built during the 2nd century and is dedicated to Lord Kurma, the second incarnation of Lord Vishnu. As it one of the oldest temples in Andhra Pradesh, it has become a prominent pilgrimage centre amongst Vaishnavites over a period of time. If you desire to feel the essence of divinity in seclusion, then you must take a tour of Sri Kurmam. One of the oldest Buddhist sites in India, Salihundam is a historical place in Srikakulam and is famous for its ancient Buddhist stupas which date back to the 2nd and 3rd centuries. It is a significant site for historians and hence, it must be visited by every traveller who is looking forward to learning about ancient Andhra Pradesh. Another beach on your wonderful trip to Srikakulam, Kallepalli Beach is located at a distance of about 9 km from the main town and hence, it is easily accessible. As the beach remains uncrowded throughout the year, you can certainly experience a peaceful and serene environment here. Apart from the above-given tourist attractions in Srikakulam, you can also catch a glimpse of the Buddha Statue in Nagavali river, the Iron Age site of Amudalavalasa, Srikakulam Hills, Baruva Beach and Kalingapatnam.